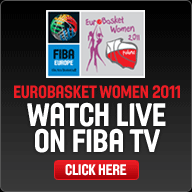 The EuroBasket Women theme from FIBA Europe this year is "stats don't lie". However looking at the expression of coaches, pictures tell a different story. Latvia and Montenegro both booked their tickets into the quarter-finals in Lodz with first game victories in the qualifying round. Yet both coaches were very cautious. Miodrag Baletic, the coach from Montenegro, does not smile that much and maintained the same expression throughout. So it difficult to know when he is happy. However George Dikeoulakos seems to have an expression for every situation. Yet his victory smile was short and sweet before the mask returned. In 2009 Pierre Vincent (right) dropped his mask and celebrated winning EuroBasket. But since the start of this competition win or lose he has been the same. After France's victory against Spain, Vincent showed very little emotion and still managed to find things wrong in the team's performance. All the same he did pay his players a little compliment by explaining that they played in the final quarter the way he wanted. That is what he wants to see more of in the remaining games. However the injury to Emméline Ndongue who ruptured her Achilles may have been the reason for his somber expression. Ndongue went down late in the second quarter shortly after scoring and had to be helped off the court. Her competition is over. George Dikeoulakos (centre in picture), the Latvian head coach from Greece, is a coach that is easily accessible to the media. But once it is game time, nobody can disturb him. He does not sit down much during a game. He paces up and down articulating instructions with hand signs and facial expressions that only his players can understand. For him playing Poland was like playing chess. He knew that his team had to make sure that Poland kept the ball on the floor so that they could exploit their ball handling skills. His players did just that in the second half and the result is history. He is aware that some players are tired and also do not have the experience yet in big time competitions. However he has no choice but to work them hard if they want to succeed. Meeting Miodrag Baletic (left), the Montenegro coach outside the basketball arena is like meeting another person. After the first phase he told us that he was happy so far. But the next three games would be difficult yet his players were intelligent. However once Baletic is in game mode, he does not stop moving and never smiles. He paces the court barking instructions such as a man on a mission. With his daughter Ana Baletic seriously injured during the first game and out of EuroBasket Women, it is understandable why he is not smiling. On his fourth victory, he explained that his team loved to play basketball and that made him happy. Now the journey continues to become one of the top teams in women's basketball.